The fast growing utility-scale PV industry in India demands well managed operation & maintenance (O&M) services to keep plant performance at par with the needed expectations as well as applicable regulations. 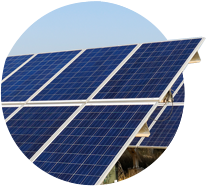 As utilities embrace and rely on solar PV grid-connected plants for both commercial and industrial applications, Tata Power Solar has the capabilities as well as experience in all aspects of solar plant O&M to help deliver optimal power. Tata Power Solar has unmatched experience in operating and maintaining large utility scale projects and solar rooftops for the last five (5) years. We also offer monitoring of hardware and services, based on the solar-log data logger platform from Germany. To monitor the operations & manage the maintenance of solar rooftops, Tata Power Solar has set up a network operations center, giving instant business insights as a value-added service to our customers. Tata Power Solar also monitors and maintains rooftop solar projects for its corporate customers. We have more than 1 GW under Tata Power Solar’s operation & maintenance management program. Our plants have an average plant up time of more than 99.6% and a proven performance ratio over industry norms of 85%.